Despite its utilitarian origins, the pick-up truck is now a popular vehicle in Malaysia, even with the urban set. On the sidelines of the 2018 Kuala Lumpur International Motor Show where the 2019 Mitsubishi Triton was previewed, our man Jonathan Lee speaks with the men in charge of the heavily revised pick-up truck at Mitsubishi Motors. “Simply, it is for functional balance. Though others have gone to seven or more gear ratios, we have also upgraded the Triton from five to six (gears). 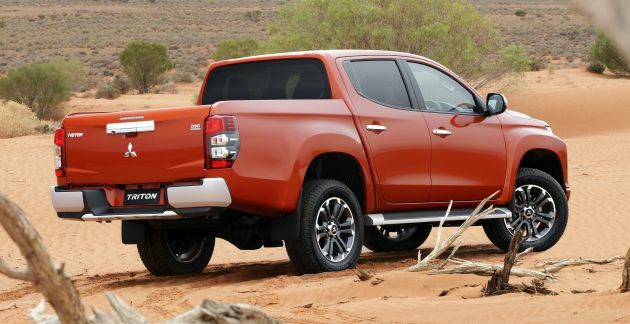 There are multiple requirements to fulfil, such as driveability, acceleration, weight, and more,” said chief product specialist for the Mitsubishi Triton Yoshiki Masuda. “Going to a six-speed from a five-speed transmission, the taller gear helps reduce engine RPM and therefore improve refinement at speed. If we go beyond that (number of gears), it wouldn’t be a good match to the Triton’s performance, which is why we found the six-speed unit offers the best balance,” Masuda said, adding that the gearbox is manufactured by Aisin. Besides the transmission, what else in terms of suspension and chassis have been changed or upgraded? “We have enlarged the diameter of the rear suspension’s dampers, and with this capacity increase we have also fine-tuned the spring settings for the front coil springs and rear leaf springs, in order to optimise the characteristics of the spring rate to match the larger rear dampers. Will Malaysians make use of new off-road modes on the 2019 Mitsubishi Triton? “Yes, I think so. Malaysian road conditions are very unique, where even big cities have unbalanced situations. Therefore, I believe this function might be useful for Malaysian roads,” said Mitsubishi Motors Malaysia CEO Tomoyuki Shinnishi. So, there we have it from Mitsubishi Motors; the 2019 Triton has been built for balance, and suited for Malaysian road conditions to boot. Check out the following videos as well, where we take a closer look at the Triton, as well as have an early impression of what it’s like to drive. ‘unbalanced situations’ is a nice political way of saying the roads in our major cities is so bad that until a pickup truck require suspension fine tuning. Lol there’s no way pleasing you guys. At least they’ve improved the product to suit our road conditions. If you need a problem for every solution, read paultans comments section…. A car that defied the purpose ! Well done, dude. That defiant will take 1st place in any beauty pageants. Sorry macho guys, this is not for you.